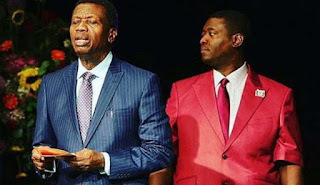 Leke Adeboye, the last son and Senior Personal Assistant of the General Overseer of the Redeemed Christian Church of God, Pastor Enoch Adeboye has told the general public to stop writing the church seeking help. In a video shared on his Instagram page, Leke described those seeking scholarship from the church as ‘jokers’, advising them to go into farming and make savings. He said: “Nigeria has come out of recession but now we are in farming, I would like to advise you my brother and sisters if you cannot afford to buy food go back to trade by barter system. “If you have beans trade with someone that has cassava because that is the only way to get out of recession because the number of letters we get in the church today asking for help. “Some jokers are even asking that we sponsor them to Russia for schooling. Why not go to a regular school in Nigeria.